Tomorrow I'm having my holiday open house for my Creative Memories business, and I'll be making Wassail for my guests. I'm going to hope for a cold day because that'll make the Wassail even better. I'll be serving my Gingerbread Cookies as well. Putting the cloves in the orange hurts the tips of your fingers, so I recommend you first poke holes in the orange with a toothpick. Other than that, it's a pretty easy recipe. Enjoy! 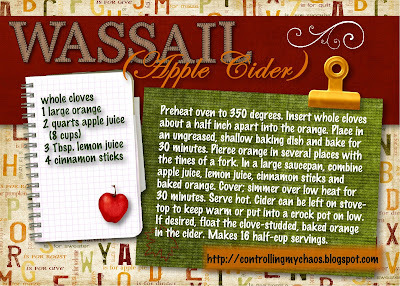 I love a good drink like Wassail on a cold winter day!! I'll hope it is quite chilly outside for you. How fun to host an open house for your Creative Memories....if I was closer I would be there! I LOVE wassail. Thanks for the recipe. Sounds perfect with gingerbread cookies.